As can be seen in the chart above, a significant rise of the price of US Treasury Bills always preceeds a monetary expansion beyond 3%. This is simply due to the fact that before the money supply appears on the bank accounts, the Federal Reserve Bank, through its FOMC, needs to begin bidding for these bills on the market. Alternatively the Fed might inject the money into banks by other means upon which the banks will initially park it in Treasuries, mostly T-Bills. Thus there is no better immediate indicator of an impending inflationary credit expansion than the price of Treasury Bills and Bonds. This is why Mike Shedlock is wrong when he expounds the issue of deflation. He has been right over the past year when he said that we were in a deflation. But he says that an increase in the price of Treasury Bills is a sign of deflation. This is of course a fallacy. An increase in the price of treasury bills is, to the contrary, the very first indicator of a new inflation. It is the sign that the past deflation has come to an end and that we are entering a new monetary expansion. There is not one single point on the chart above that would corroborate the opposing view. I agree with Mike that gold has bottomed out, albeit for a different reason. The new money inflation has begun. Treasuries are once again the first assets to soar. In about 1-2 years from now the current Wall Street bear market will bottom out and then start a new primary rally. Gold will pick up steam from now on and stage a major rally once the aforementioned stock market rally comes to an end. I, too, don’t like too see inflation raise its ugly head again. We need a deflation, badly, to save us from complete financial havoc. But the government is at the very least slowing it down significantly. Whether we like it or not, we have to observe the data in an unbiased fashion. This is not to say that the numbers may not swing back with a resumption of the deflationary trend. But we should not just cast them aside just because we don’t like what they tell us. 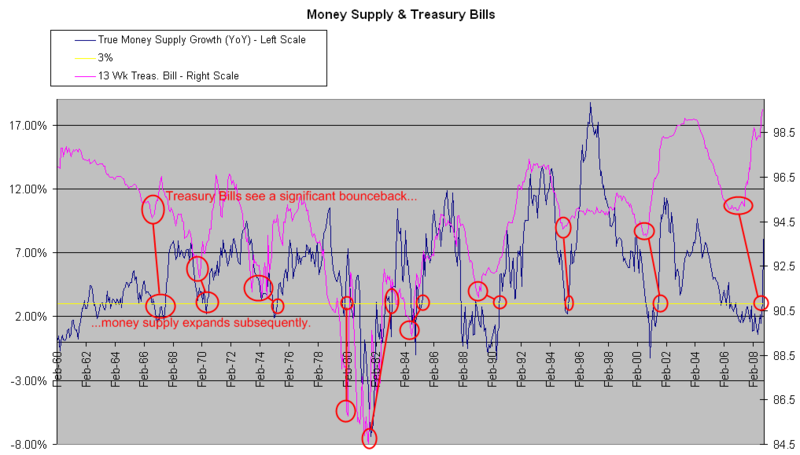 Money Supply – December 2009 – Early Double Dip Recession Signs? 2 months ago I wrote that Citigroup, GM, Ford, or GE will go bankrupt soon unless they receive additional bailout money. Of course this wasn’t a strike of genius, I was merely pointing out the obvious. As far as GM and Ford, they don’t deserve any more mention. These two giant jokes cannot possibly be called business operations. It is insulting to see the media seriously pose the question as to whether or not the taxpayer should even consider sparing his change for these miserable failures. It hurts to see their executive junkies squander more money on private jets to capitol hill in order to petition for yet another bailout fix. They, along with the UAW, need to be wiped off the face of the earth once and for all and stop making the American car industry the ridicule of the world. Citigroup is finally approaching its endgame, too. Citigroup executives began weighing the possibility of auctioning off pieces of the financial giant or even selling the company outright, the Wall Street Journal reports. This would actually be the right move. But it would expose the truth that Citi isn’t worth anything. At this point, the only salable unit appears to be Citi’s GWM (Global Wealth Management) division. Its profit only dropped by 27% for the first 3 quarters of 2008 when compared to the same period in 2007. Global Cards was still profitable in the first 3 quarters but dropped by 79% and will, without a doubt, get wiped out in 2009/2010 with the inevitable collapse of consumer credit. The other 2 divisions, ICG (International Clients Group) and Consumer Banking have turned profits in the first 3 quarters of 2007 into substantial losses in the same period for 2008 (1.8 billion and 10.4 billion, respectively). The internal discussions are at a preliminary stage and don’t signal that Citigroup’s board and management are backing down from their insistence that the New York company has ample capital, funding and strategic direction, the Journal reports, citing people familiar with the matter. – Citi is holding $1.1 Trillion in off-balance sheet assets. Citi is a lost cause. Finally their management is waking up to reality. The company, as we know it, will not survive. The objectives of economic policy are to continuously improve the well-being of the largest possible number of people in society by making sure that the scarce resources available on earth are utilized so that every one’s most urgent needs are satisfied before less urgent ones are addressed. In an interventionist system, however, the entrepreneur who operates at a loss has another choice: He can petition with the government for a bailout. Under this arrangement, the government obtains additional tax money from the people under its governance territory and uses it in order to cover the losses generated by the business. It hence forces the people to restrict their consumption in order to keep up an operation that, from the their own point of view contributes to a lowering of their standard of living. It relieves the entrepreneur from the responsibility for this damage and lets the taxpayer, the consumers, shoulder it. Alternatively the government can obtain the money by having the central bank produce it and make it available to it in a credit transaction. This would of course result in inflation and credit expansion, which again the consumer pays for in the form of prices that are higher than they would have been without the intervention (this could be rising prices, but it could also just mean prices that are dropping more slowly). The government could also borrow the money in a credit transaction on the market, along with the implicit commitment to tax people in the future, meaning to forcefully take their money, in order to repay this debt. All this does is to shift the burden of restricted consumption into the future, while in the present withdrawing resources that capitalists may have employed for factors of production in profitable, and thus urgently demanded, operations, instead of loaning it to an entity that can simply repay by stealing it from others, and thus has no incentive to address consumer demands. This can be vividly witnessed in the fact that the money is made available to largely unprofitable businesses in a corporate bailout. If unprofitable, in other words wasteful and less-urgently needed operations are subsidized while proper conduct is taxed and thus punished, it is only to be expected that more undesired behavior will be encouraged. Irresponsibility, short-sightedness, and imprudent conduct in business will the the inevitable outcomes over time. Either way, such a policy of course necessitates a well planned and thought out propaganda and fear campaign before public approval will be granted. The management style of the business will then in no way be a profit oriented one. If not already bureaucratic, it will become an inherently bureaucratic operation. But the bureaucratic style is precisely the opposite of what it needs. It needs to stop withdrawing resources from occupations where they could fulfill more urgent and ample needs from the consumers’ point of view. But even from the business’s point of view there is no long term help for its employees and managers if its failed operation is bailed out. The bureaucracy and inherent lack of innovation will ultimately maneuver the business toward a devastating collapse which can no longer be justifiably funded out of tax money. All employees will lose their occupation. But since the failed operation went on for much longer than necessary, the bulk of the employees will be trained in ineffective, outdated, and unprofitable procedures. Now it will be even harder for them to adjust to the conditions on the market. This holds true for any type of business, no matter what products and services it provides. Whether it builds cars or brokers credit transactions, the consumers’ judgment tells the entrepreneur whether they are supplied with the most urgently demanded goods or not. The more resources the business employs, the more suppliers it purchases from, and the larger the loss, the more will the standard of living of the common people, the consumers, deteriorate, if the bailout intervention continues. Every single dollar appropriated would be better employed by the consumer it is forcefully taken from. Every dollar used to obliterate the loss is misspent. The larger the business that is being bailed out, the more immediate harm is inflicted upon the common man. Thus, there is nothing that could be farther from the truth than the argument that some corporations are too big to fail. It is hard to find a more sinister and callous consumer scam perpetrated upon the populace than the corporate bailout. It adversely affects the standard of living of the common man, who is consumer, taxpayer and worker at the same time, and on top of that leaves the employees of the business poorly trained and inflexible once the inevitable collapse occurs. Bail Out Detroit? – Now?? I think the easiest, and most convincing proposal toward sound money is the following: Don’t abolish the Fed. Leave it in place. But allow other individuals to compete in the business of money production. Don’t prosecute them for producing their own money. Don’t force individuals to accept paper fiat money via legal tender laws. Leave it up to them to decide which money to accept and which not to accept. Let the consumers decide whose money they prefer. Don’t tax them when a high quality money that they are using becomes more expensive in terms of another, inferior money. Get rid of capital gains taxes on gold and silver. Abolish capital gains taxes on gold and silver. Author NimaPosted on November 19, 2008 November 19, 2008 Categories Monetary Economics, PoliticsTags abolish the fed, central bank, federal reserve bank, fiat moneyLeave a comment on Abolish the Fed? As mentioned in Money Supply October 2008, the money supply has grown by $150 billion or 8% from October 2007 through October 2008. 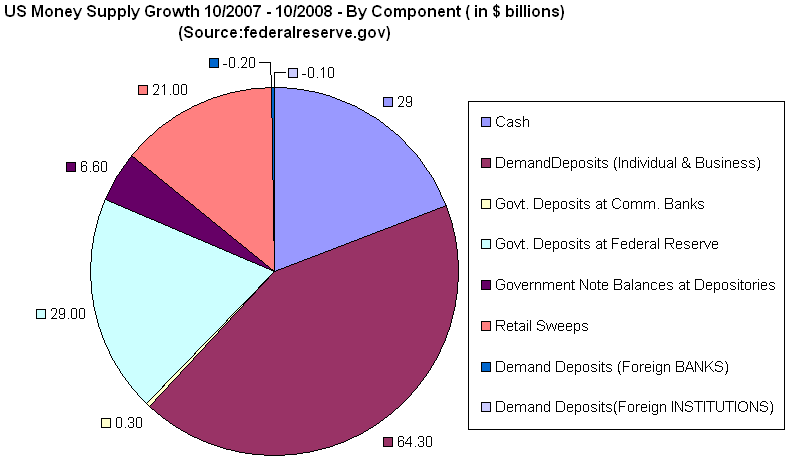 Based on this chart, the most significant contribution to this growth has been in domestic private and business checking accounts ($85.3 billion or 57%), which needs to be calculated by adding up retail sweeps and demand deposits, followed by a growth of $29 billion or 19% in cash and an equal amount in government deposits at the Federal Reserve. The contribution of government deposits at commercial banks, government note balances at repositories, and deposits of foreign banks and institutions has been negligible.